I'm really REALLY excited about the Give Away this week here from Donna's Lavender Nest. Donna has let me pick fabrics from her store to make a custom Freda's Hive fat quarter pack. 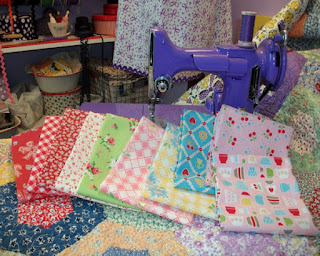 And she is going to let me give the fat quarter pack to a lucky blog reader this week. Also, the bundle is available for purchase in Donna's online shop. Donna has really lovely fabrics in her online shop. I like to call them all "Nanette fabrics", meaning they are all fabrics I want in my stash and that match the kinds of fabrics I use in my projects. See all the cute fabrics in my Freda's Hive pack above. They are a combination of Lecien, Yuwa, Lori's Riley Blake and Pam's PKM fabric. You can find them all in Donna's shop. I really like combining lines of fabric so it was fun to pick from Donna's stock and make my own bundle. Here are the beautiful fabrics for a closer look. I really am so excited to have Donna work with me. If you don't win the Give Away, remember, you can visit Donna's shop to purchase your own Freda's Hive bundle. I have a project I'm thinking of making with the Freda's Hive pack. I was considering making a tutorial with the fabric. But then I thought about several tutorials I've seen around blogs that I've wanted to make. So instead of reinventing the wheel (so to speak), I'm going to use a couple tutorials from blogs and next week I will post the links for those and start using the Freda's Hive Fat Quarter pack from Donna's Lavender Nest. Leave a comment here, any comment, to enter the giveaway. I'm going to add a few goodies from me along with Donna's fabric for the give away. I'm looking forward to this week. The give away ends Friday evening at midnight and I'll announce the winner Tuesday, May 28 (after Memorial Day). Oh no Candice - it HAS to be #2, oh please oh please oh please. Nanette, this one is worth begging and groveling for! I really love your selection and I would make my caravan quilt with these beauties. Beautiful choices Nanette.....oh, the possibilities!!! A very sweet fat quarter bundle to play with... what's not to love? Thank you for the opportunity to win your generous give away! A gorgeous group of fabrics. I would love to have it and follow along with the tutorials. Here's hoping. What a fabulous bundle of fabrics. I could make some wonderful quilts with it. I know exactly what I'd make if I won that bundle of Freda's Hive luscious color...a scrappy churn dash quilt which has been on my bucket list for what seems to be like forever...with a white background, of course! *wink* I was just waiting for the right fabric combination and now you've done all the fabric selection for me! Thanks for the opportunity to win and for Donna's generosity. You gals are the greatest! Beautiful fabrics! For a fresh and lovely summerquilt! Thanks for the chance! So pretty! I really NEED to win these lovely fabrics. Thanks for the opportunity. What a very pretty bundle. Thank you for hosting the give away and can't wait to see what you do with them, too. Oh so pretty. These fabrics would make a wonderful bag. Ooooh, love the fabric combination you chose...very sweet! Such pretty fabrics! Thanks for the opportunity! I love the bundle you selected - so bright and happy. Thanks for the chance to win! I love these fabrics. I can think of lots of projects too! Such pretty choices. They remind me of you and your style. It would be so much fun creating something with these fabrics. I'm looking forward to seeing what you come up with. What an amazing collection of beautiful fabrics - so many possibilities.... thanks for the opportunity. Great choices and I love every one, thanks for the giveaway. I'm so in love with Loris Bake sale! Thanks for a chance to win! and follow you on your blog when as you use them. for such a Fantastic Give-a-way to win please! 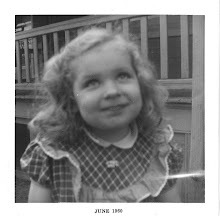 Thanks for a fabulous blog - it's a great read! 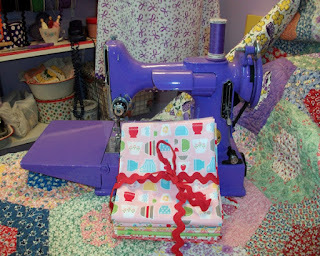 I love the fabrics you've chosen and I love the little purple sewing machine. Is it real??? I want one of those too!!! What a beautiful collection for a quilt! Love, love, love it! As always, you are such an inspiration for me. Ooh! Fabulous! And it's mostly pink! Nice job on pulling from all of those fun designers. Thanks for the chance to win. What a lovely assortment of fabrics!!! It's so cute! this bundle is just bursting with charm! thanks to you and Donna for a chance to win. Some very cute fabrics in that bundle. I would love to come up with a project for them. I think it's unanimous, we all are coveting this fabric pack. What perfect fabrics you've included, each more adorable then the next and all perfect Freda's Hive fabrics. I'm looking forward to your tutorials. Oh I love all of the pretty colors!! Thank you for the give away!! I *need* those fabrics! Now that I've seen them I will explode if I don't get them! love the fat quarters bundle, how sweet it would be to win! oh, the things i would sew! Oh, I would love to win those beautiful fabrics. Looks good enough to pet! Thanks for the chance. Cute fabric count me in. What a gorgeous collection of fabrics:>) Thanks for hosting a great giveaway! thank you for the chance to win such beautiful fabrics! Wow, how generous! I'll go check out her shop *in case* I don't win! :) Thanks for the chance! That is a great punch of fabric, so pretty. Wonderful fabrics! Thanks for hosting this giveaway. Outstanding offer! If I don't win, I'm definitely going to buy this precious bundle. I love your choices-the colors are great! Thanks! I love your bundle of fabrics! Thanks for a chance to win. What amazing fabric...thanks! And the added excitement that you will add other goodies just sweetens the pot. HI! 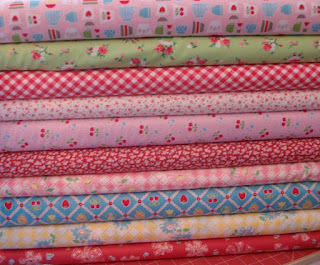 WHAT A BEAUTIFUL BUNDLE OF FABRICS>JUST GORGEOUS! That's a charming group of fabrics! What a super giveaway! And I can hardly wait to see what you make with them! I, too, like the colors and fabrics you chose. I tend to like vintage and pastels. Thanks for the chance. Oh my! Very exciting, & all fun fabrics! I love the fabrics you use in your quilts. The fat quarter bundle is so bright and happy! I can't wait to see what you do with them! Too sweet, the giveaway and you too! Thanks for making a dreary day bright and cheerful! What a fun group of fabrics! Pick me! What a lovely bundle! Thank you for sharing with us! I haven't ever won anything. I hope my luck changes for this one. I love these fabrics and fun to learn of a new online store to add to my stash! Thank you for having this wonderful give away. You certainly have wonderful taste in fabrics! I love all of these! Such beautiful fabric! I can't wait to see what you make with it. Beautiful fabrics! Thank you for the opportunity. That was so sweet for Donna to offer them. Beautiful fabrics!!!! Thanks for the giveaway! That is the cutest bundle-such sweet prints! I've always loved your taste in fabric! Those fabrics are exactly the colors and style I am drawn to! They would match my sewing room beautifully. Sure hope I win! Thanks for the chance! Love those pretty fabrics. Tanks for the chance. Love your choice in fabrics! Thanks for the chance to win! Count me in..what fun fabric! But I never win ANYTHING ! Such pretty choices....my mind is already thinking of what to create! That is a beautiful bundle! I am looking forward to seeing what you have planned! Oh my my! All my favorite lines of fabrics! I don't know how you were able to choose just a few from each line! It would be a dream to use these prints in one of my quilts! such lovely fabrics in your bundle! Good morning.... Love those fabrics! Can't wait to see what you come up with next week. You made up a great bundle! I would love to have these fabrics come live at my house. Thanks for the chance to win. I can't wait to see what you make with this bundle. Oh wow, how awesome is this bundle! I'm gonna have to buy it if I don't win, but I'm feeling lucky... lol, yeah right I never win, so I may as well just buy it! Hi - I just love your site. Could you please let me know if you have a pattern for the quilt in your header? It is wonderful. Thanks for the chance to win. A fabulous bundle! thank you for the giveaway!! I would love to own these fabrics. They are just beautiful. cute fabrics and they definitely are "you". thanks for the giveaway. I can not wait to see what you have wanted to make - your bucket list so to speak. I will be following with thimble on!! Your fabric choices are so eclectic and beautiful, playful and colorful..... that says a lot about YOU! Thank you for all you do and your giving spirit! I love those fabrics@! Thanks for the chance to win! omg, this is fabulous to giveaway...I so want it. Love the fabric pack! Does it come with the purple featherweight too?? Awesome photo and thank you for the giveaway! I love that fabric and your featherweight is gorgeous! These sweet fabrics would look darling on some old fashioned camper quilt blocks I'm making! Will cross my fingers! What a lovely bunch of fabrics! Thanks for hosting the giveaway! They look like lovely fabrics. Thank you for offering the generous giveaway. Wow, what a beautiful selection of fabrics. Thanks! Those are probably the exact fabrics I would have picked! How did you know? What a great bundle you've chosen. Donna does have such lovely fabrics. Thanks for the chance to win! Lovely mix of fabrics. So many things that could be made from them. What beautiful fabrics .would go beautifully in my journey of a quilter. Thanks for the chance to win them . Such lovely fabric! Thanks for the chance. How fun! I just ordered some Bake Sale and the tiny Lecien strawberries and they arrived two days later! Donna has a fabulous shop! Wow! 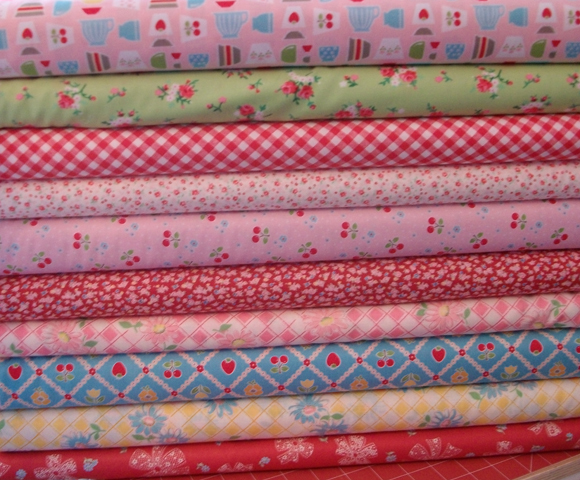 What fun it would be to win a Freda's Hive bundle of fabric! 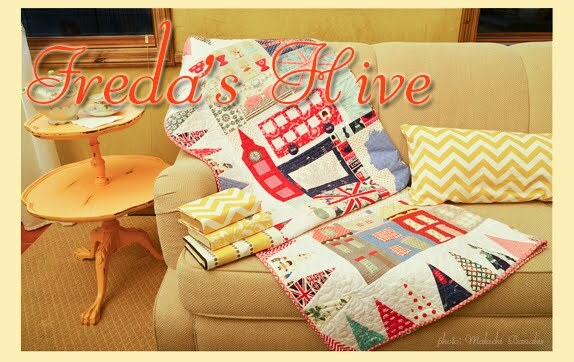 Then the possibility of eventually having a "Freda's Hive Quilt" would almost be real!!! Be still my heart!!! Sign me up - I'd love to win! What a delightful group of fabrics! I love your selection! Thanks for hosting this generous giveaway! I am "lusting" after the lavender Featherweight. Purple/lavender is my favorite color. I too love mixing fabrics from different fabric lines. Thanks for selecting these fabrics and the generous giveaway! What a great fabric bundle! I love the fabrics you choose for your quilts, but then, I love the quilts too, lol. Adorable! Thanks for the chance, woohoo! Its never too enough fabrics for us quilters,hehe. I looooove making bundles! Picking fabrics is the best part of quilt-making for me, go figure ♥ Your bundle is fabulously adorable, thank you for the giveaway! Gorgeous fabric. Thanks for the giveaway! Looks like a stack of inspiration to me! Thanks for the giveaway!! Holy Cow! I will never win out of 138 entries, but thowing my name in anyway! Loooovve these fabrics and love your projects! What a wonderful selection you have have made and well done for combining fabrics from different manufacturers instead of just choosing from one line. Your project can't fail to look lovely. Such sweet fabrics! I would love to win the bundle. I love them all you did a good job picking those out. I want them to come live at my house.